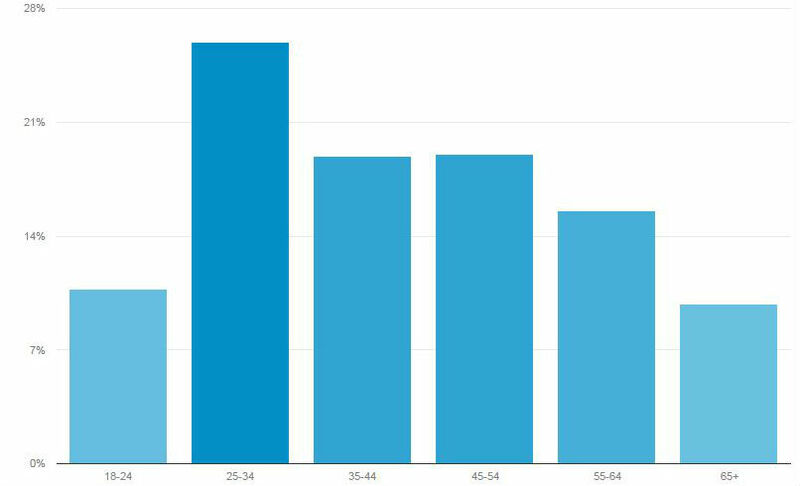 Chart from Google Analytics shows age distribution of readership in April. Times of San Diego was read by 153,315 people in April, and for the first time more readership came from smartphones and tablets than from desktop and laptop computers. April was the 13th full month of operation since the independent news site debuted in March 2014. Smartphones were used for 41 percent of reading sessions, tablets for 10 percent and desktop and laptop computers for the remainder. The website uses responsive design so that pages are automatically re-sized for different screens. Readers continue to be young and local. Those aged 25 to 34 accounted for the most reading sessions at 26 percent of the total. Readership in the 35 to 44 and 45 to 54 age groups was tied at 19 percent each. Readership was largely local, though popular stories about controversy over SeaWorld and Naval deployments drew significant national traffic. Just over 43 percent of readership was from San Diego County, and 14 percent from elsewhere in Southern California. Times of San Diego provides essential news coverage of and thoughtful commentary about San Diego. The website is free to readers and supported by online advertising and donations.